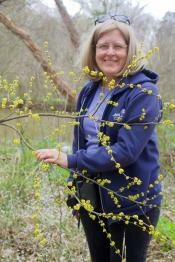 Come to our February 28 meeting and talk with Nancy Vehrs, President of the Virginia Native Plant Society. She will tell us what is going on at the state level, including the VNPS affiliations with the Virginia Department of Conservation and Recreation (DCR), recent land purchases, and how VNPS interacts with some of the political bodies at the state level. As President of the statewide Virginia Native Plant Society (VNPS) and Chair of their Prince William Chapter, Nancy focuses on promoting the use of native plants for home and commercial landscaping. She also leads weekly bird walks, has been a team leader at the Nokesville Christmas Bird Count since 2008 and leads a sector of the Manassas Butterfly Count. Nancy’s activities directly benefit many hundreds of people. She provides programs for students, leads nature tours and citizen science surveys, provides presentations for homeowner and civic groups, collaborates with government parkland managers, and meets with elected officials. Her on-the ground restoration activities create opportunities for people to give back to their community and learn a lot in the process. Please join us! We meet on the fourth Thursday of the months of September through May at the Norfolk Botanical Garden, 6700 Azalea Garden Road, Norfolk, VA 23518 at 6:30 p.m. The social begins at 6:30 PM and the meeting will start at 7:00 PM. We do not meet during the vacation months of June through August. Our meetings are free and open to the public. Please come and bring a friend. Light refreshments will be served.